Hi-Fi and Home Cinema - Come down and see why we love what we do. Enjoying music and films with great Hi-Fi And Home Cinema solutions are some of the finest pleasures in life, and we are passionate about providing advice and equipment to let you indulge yourself every day. From your first stereo, through to dedicated music and home cinema rooms, we help you choose the best system for your home. Great Hifi systems have a long lifespan, and are worth investing in. A great sound today, will continue to be a great sound into the future. Although the sources for playing your music have evolved, from records through tape and CDs, to file playback, and now to streaming services like Spotify, Apple Music and Tidal, the amplifier and speakers remain the backbone of a good system. These are the parts to invest wisely in to get the best of your investment. These are key things to consider and our knowledge from past experience helps us get it right for you. Both companies lead their fields, and continue to push the envelopes of materials and technology to give us a new reference level of musicality. 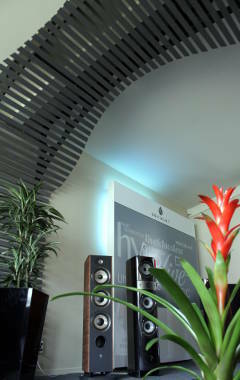 Come in and listen to the Focal Utopia series speakers, with their beryllium tweeters. Beryllium is the lightest, stiffest metal known to man, and Focal’s patented technology allows them to form this into the most responsive tweeters we’re ever heard. The effortless top end gives life to the most delicate of sounds, and reveals so much detail in recordings of the ambiance of rooms, and texture of instruments that you’ll be amazed. Come in and listen to the Devialet amplifier. The radically stylish Devialet amplifier, our other favourite, is also a technological marvel. With 35 patents contained within its mirror polished exterior, this device re-writes the way we’ve built amplifiers for the last 100 years. This is a hybrid, analogue and digital amplifier (ADH), sampling all of it’s inputs at a very high quality, enabling unheard of control and configuration, then producing the analogue output with a class A amplifier, before adding large amounts of controlled digital power to drive your speakers. It’s ability to measure how the speakers are responding, back down the cable, combined with their massive database of loudspeaker models, gives rise to their new Speaker Active Matching (SAM) technology. This enables the amplifier to compensate for speaker quirks and inefficiencies, extending the bottom end by around and octave, and enable excursion to be controlled, eliminating overdriving. Has to be heard to be appreciated. As well as their headphones and studio monitors. Dedicated home cinema systems are a great source of entertainment at home. With the cost of a movie outing for the family going crazy, and TV screens getting to good sizes, adding high quality surround sound makes a lot of sense. Far from the few plastic ball speakers on sticks, with cables cellotaped over the doorway, a well set up home cinema should be heard but not seen! Speakers can be mounted in walls and ceilings, custom painted to match your colour scheme, and even subs can be mounted directly in the walls, or hidden in other spaces. The wide experience of our team stretches from the concert stage, to the recording studio, so we know the experience you’re looking for.